In order to fulfill the need for ornamental fish for the edifice of a landmark building in Midtown, a 1858 Federal style gatehouse, they turned to the one company capable of such authentic recreation–Gotham MetalWorks in Brooklyn. Normally, recreating an item like this involves creating a plaster cast, something impossible with an item made of four separate pieces. Instead, the craftsman at Gotham MetalWorks created a rubber mold, then a plaster cast of each piece, sharpening detail after each imaging. 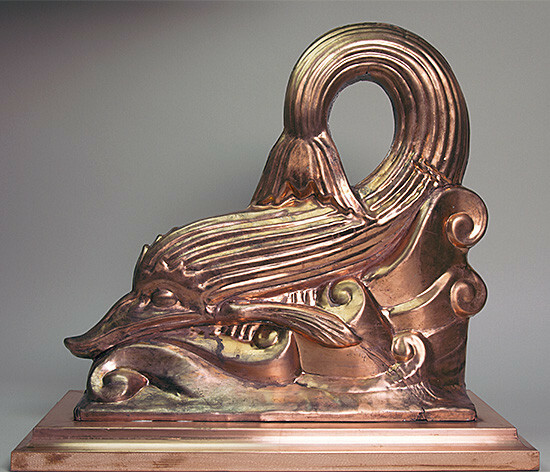 The final piece was stamped in copper using a pneumatic press, precisely reproducing the architectural element. “We are likely the only metal shop in the region with the capability to have done this reproduction with the precision and authenticity that the client required,” said Branch Manager Doug Kisley. Gotham MetalWorks has a long standing history with landmark buildings throughout NYC. Because these buildings require specific replication of existing materials during restoration or renovation, approval can be an arduous process for contractors and architects. With an extensive knowledge of historical preservation coupled with CAD and state-of-the-art techniques, Gotham MetalWorks focuses on achieving the desired result of both client and contractor, while adhering to the Landmarks Commission codes.